Two thoughts about freedom of movement, not directly related to Jeremy Corbyn’s speech in Peterborough today. Maybe more related to the ‘framing’ that preceded it (via the press release), but most of all in relation to the general stew the Labour left is getting itself in over immigration. Firstly, if we’re going to talk about low wages and “social dumping” (which is both a function of capitalism, and the fundamental inequality within the expanded EU), then we should make sure that we also talk about the main labour movement response, which isn’t purely about regulation, but organisation. Sadly, many unions have offered lip service only to organising migrant workers and levelling up on wages since the EU enlargement in 2004. Falling back on Little Englandism post-Brexit is at best a masking of those failures. That important part of the jigsaw – union organisation with migrants and others on the periphery of the labour market – went missing in that press release today. It wasn’t much present in Corbyn’s speech, which mentioned workers rights, but not organising and campaigning. This was also missing in the referendum campaign – for example, the posted workers directive was only mentioned in the last week. We can’t afford to miss this stuff out, because it forms the basis of our opposition to UKIP. Secondly, let’s not forget about the big picture. This issue, like Brexit, was always going to be tough – and to lay the blame purely on Corbyn’s head is ahistorical nonsense, which does none of us any good. For the last two decades at least, we’ve taken for granted huge swathes of the working class (and my that I mean the working class in all it’s diversity, not a “white” working class) and a simple consequence is that they’ve stopped listening to us as a party. This is a much deeper crisis than anyone seems to realise. 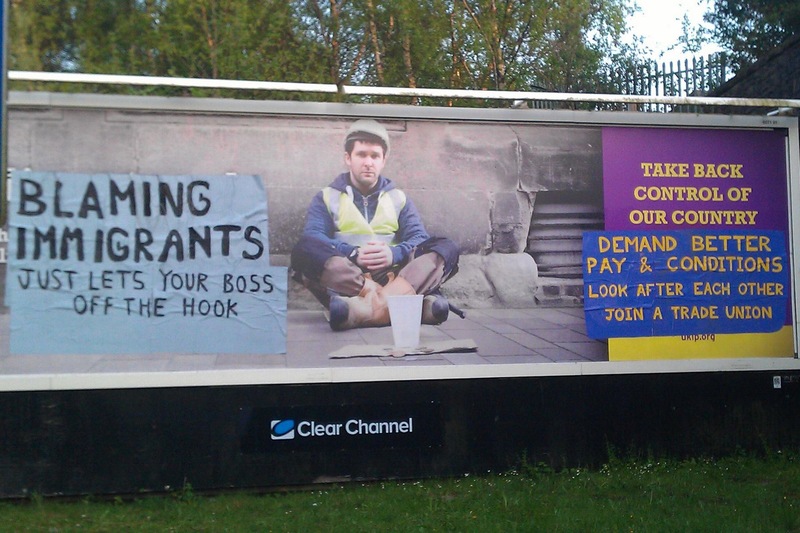 At the same time, the right wing media has still had their ear, and that, combined with a folklore that has gone about in many working class communities (that it is the migrants to blame) has really taken root. It’s toxic because there are real job losses going on in those communities, leading to real poverty – and the left (broadly speaking) hasn’t been there to explain the real reasons for those changes – neither have the unions to a large extent. None of this is especially surprising, but it is a huge mountain to climb. It will take a long time, as there are no easy fixes: only by using our remaining links – what’s left of the unions especially – to get back into those communities and start to build trust again can we do it. That involves (a) creating a more dynamic union movement and (b) a community-based organising approach. I’ve seen it happening on a small scale with the Durham TAs over the last year. It can be done. As well as getting into those communities, we need to have a positive alternative which directs people’s anger upwards, instead of at the people next door, or from the agency. That won’t happen by magic, as if we can shift the dead weight of “common sense” over night, with a press release or a speech. It’s down to all of us. But we’d best crack on.